I think poor Muffit has been misunderstood most of his life. Fortunately (and yeah I’m tooting my own horn here but oh well!) he now is in a home where he is very understood. I think this, because last weekend at flyball practice Muffit was being held by my flyball captain, and he didn’t want to be so he was snarking at her… fake snapping. She didn’t let go, because she understands him too and is good with dogs, so he stopped after only a couple of snarks realizing that it wasn’t getting him anywhere. I think in his past Muffit’s behavior, such as being squirmy and twisting out of people’s grasp, as well as the snapping behavior, has gotten him what he wanted and so he’s learned to utilize it. He is pretty bad when getting his nails trimmed. He will let me handle his feet as much as I want, unless the clipper or the dremel comes out, then he’s a squirmy worm buggy boy and flips all over, mouths me, and does anything he can to get away from me. So now Muffit gets to learn that those behaviors that intimidate and scare people who don’t know dogs, will not work on me and my dog friends. And I do think he will learn it quickly. He’s also learning to control himself more. I was at a USDAA agility trial today (I’ll post more about it tomorrow) and Muffit did so good! He only yapped in his crate for about an hour in the morning, then he was quiet! And when I brought him out he was interested in other dogs, but he didn’t get completely frantic like he has in the past. So I am very hopeful for this boy now! I am pretty tired this evening, and Muffit is as well. The rest of the dogs are also sleeping too. Even Lucy and Angel got to go on a big long walk with their Dad. I love when the dogs are tired… a tired dog is a happy dog. Though they dogs really are due for baths, maybe under a Hansgrohe faucet… and baths don’t make them happy! But not today. Tonight is for rest and recuperation. Especially my old boy Levi. He did such a good job! I need to take pictures of all the ribbons Chase and Levi won me today! 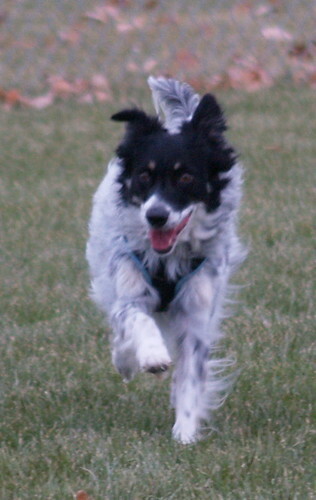 I had a Border Collie that would jump fences when it thundered. That was the only time he did it and I am not sure why it was a trigger for him. He got plenty of outside time and exercise as he was walked frequently and in different areas. He even got to go out to the land with us and visit with the horses, cows, and goats. Hi Alasandra, He was probably quite afraid of the thunder. This is common and dogs will bolt to get away from them, with no thought of what they are doing or where they are going. It’s very important to make sure dogs are safe and secure in thunderstorms and fireworks too! I’m glad Muffit did so well at the trial yesterday! It was a good day for all your boys! Have fun today and I can’t wait to hear how it all goes. That’s great that Muffit knows he can’t get away with things any more. They soon learn don’t they. They will only carry on with their bad behaviour if they are allowed to. Oh. One thing to add. A tired dog also makes for a happy owner! Ah. Peace! Previous Previous post: Why Do Dogs Escape Their Yards?